This morning in Yankees Universe the story lines include three 3s: A three-game sweep at the hands of the White Sox, a weak three-game lead over a scary Tampa Bay Rays team, and three home runs in as many games for Derek Jeter. It is the first time Jeter has homered in three straight games in his career. That 3rd home run was hit last night. Before the game, Jeter responded to insinuations ESPN's Skip Bayless made earlier in the day that his great year might be the results of PEDs. He is quoted in this morning's New York Daily News as joking, "Maybe Skip Bayless should be tested." Jeter, of course, wasn't the only one taking issue with Bayless. I have yet to find anyone who agrees with Bayless and I probably never will. 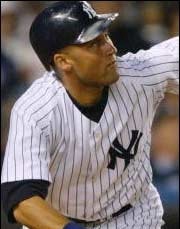 Derek Jeter is the face of Major League Baseball. He is known as one of the guys (or, maybe even the only guy) in the game who has done absolutely everything right his entire career. That is why doing what Skip Bayless did yesterday is so shocking. "I’ve never taken performance-enhancing drugs. I’ve never taken steroids. That’s it.” [New York Daily News]. I'm inclined to believe. I don't truly believe, although, if I had to give you a percentage I would say 99.999%. Why? Because Derek Jeter is a human being. No one, absolutely no one is perfect. That is what Skip Bayless is right about. He is right to bring that fraction of a percent to light and talk about it. I hope that it remains just talk. I can only imagine what the baseball world (or, even the world at-large) would be like if the Captain Of Baseball was caught cheating. Saying it would be a sad day would only start to describe it. Hopefully that day will never come. Come on. He's not Jesus, he's Jeter. Both their names start with the letter "J" and both have five letters, but that's where the similarity ends.